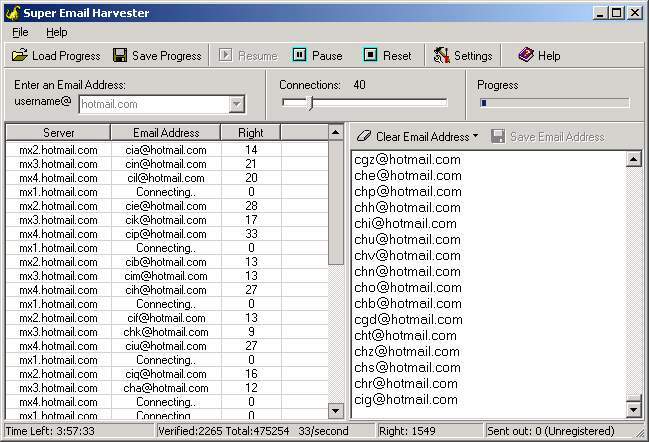 Super Email Harvester extracts e-mail addresses from targeted email servers. It connects to the email server directly and simulates sending a message, but does not send the message out - Super Email Harvester disconnects as soon as target email server informs whether this address exists or not. Safe! NO trouble with your ISP. Super Email Harvester only verifies bulk email address via email server, Does NOT use the smtp(port 25) of your local ISP. Intelligent! If the mail server interrupts the connection, Super Email Harvester will reconnect to the email server automatically and continue searching. How to send bulk email with Super Email Harvester?